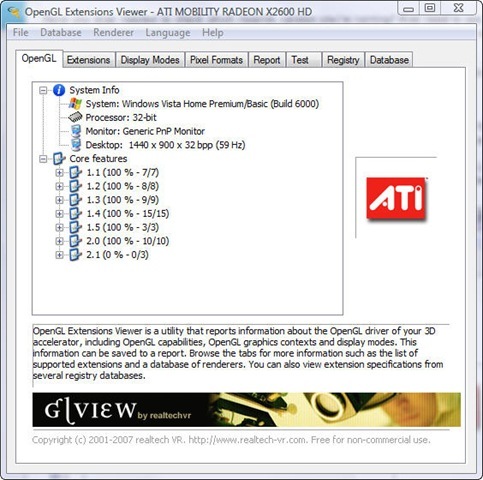 This entry was posted on December 16, 2007 at 3:47 pm	and is filed under OpenGL. You can follow any responses to this entry through the RSS 2.0 feed. You can leave a response, or trackback from your own site. All was fine until ( I the ignorant ) clicked on the large horizontal arrow in the “Render test” option. The screen went black with a box, saying: “out of frequencies”… as nothing happened and pressing ESC didn’t help… I just restarted. I need to have it on my computer as I have to run graphics card for my 3D animation programs. Please, can you help with advise. How can a newly installed copy gives me same error? Is the failure “stuck” somehow in the windows registry and blocks the new copy with same error? Bob – wish I had a quick and easy solution for you, but unfortunately I don’t. It sounds like something was modified in your registry that isn’t getting un-done through the uninstall. This registry mod could be causing a bug either in the extension viewer, or the OpenGL driver which in-turn is affecting the viewer. 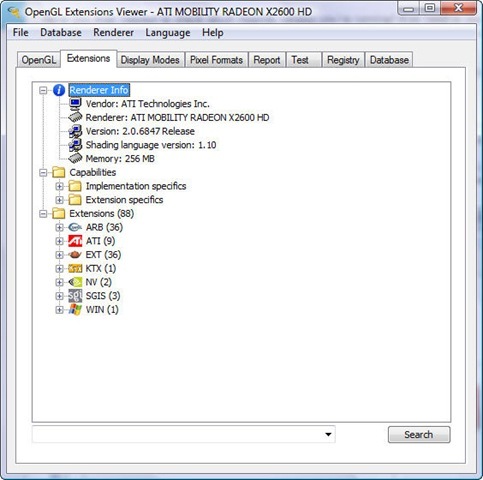 I would try searching the registry for the string “OpenGL Extension Viewer” or just “OpenGL” and see if there are any lingering entries that look related to the viewer (after doing an uninstall first). If you find entries that are for the viewer then I’d delete them. Once you’ve gone through the whole registry, then just reboot and try installing the viewer again. Thank you for the software, I have been searching for this for a long time. Any clue how to get a system that “thinks” it only supports OpenGL 1.1 to “think again”? I’m running XP and had some old Matrox cards in, until I upgraded this morning. After that I was on OpenGL 2.2 (via a pair of Radeon 9250 cards). But moments later I had to do a system restore to undo a subsequent software uninstallation, and voila – my system now seems to *think* it only supports OpenGL 1.1. Even though its running my monitors nicely from the two new Radeon 9250 PCI cards, and the old Matrox cards are in the bin, and their driver’s long uninstalled. By the way, windows update reports “nothing to install”. 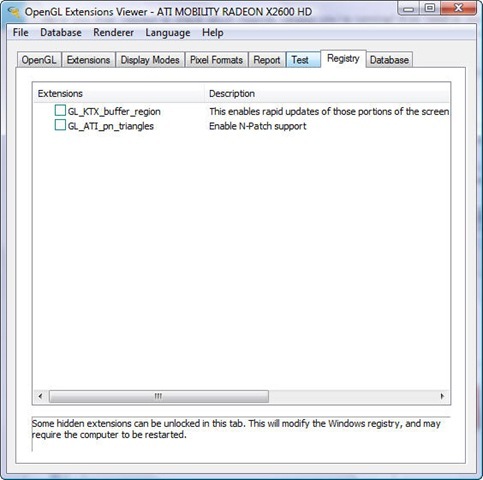 The “Driver Version” for OpenGL is reported as 6.14.10.0103-16.94.35.04 19-Dec 03. So forget my previous question!